Blade construction: Shinogi-zukuri Iori-mune small-sized katana. There is less curve and narrow in Mihaba leading to a middle kissaki. There is a Sankoken 三鈷剣 carving in front and URA side is Bonji 梵字 plus Rendai 蓮台. 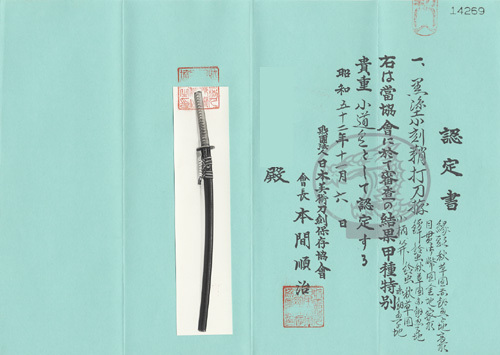 The entire blade is suitable for Battōjutsu 抜刀術. (click HERE for higher resolution image of the entire blade). Forging(Hada): Forging is fine Itame hada which is covered in sparkling Ji-nie granules glitter over the surface. Temper(Hamon): Hamon is Nie hard metal granules based, starting with long Kyo-style straight Yakidash then large Gunomes generating Dōran-midare (big-waves). Extravagant temper is covered with sparkling snow-white glitter brightly, partially with coarse/darkish glitters. The interior of temper is filled with crystallized deep Nioi-mist with abundant Nie-ashi feet activity.There are some Muneyaki (temper marks on the back ridge). Temper of tip(Boshi): Boshi becomes calm on the Yokote ridge, then straight with fray (hotsure) indication up then turns back deeply connecting to Muneyaki. Tang(Nakago): Nakago is in UBU original. One peg hole. O-Sujikai (greatly slanting left) with Kesho (horizontal) filemarks.Back ridge of Nakago is round and Single-bevelled (kengyo) heel shape. The signature in haiomote is five character that reads Suishinshi MASASHIGE 水心子正秀 and the ura side is chiselled with the date of year In the 8th month, the 1st year of Kansei(1789) 寛政元年八月日. Renowned smith Suishinshi MASAHIDE 水心子正秀 was born in Kansei 3 (1750), in Akayuzai 赤湯在 (now in Nanyou city, Yamagata pref.) as a son of Samurai who lived in Yamagata domain. Child-name was Sanjirō 三治郎. After his father died young, he and his mother moved to their relative Suzuki Gonjirou 鈴木権次郎 to give him the name Suzuki Saburou Iehide 鈴木三郎宅英. He devoted himself to sword forging ever since childhood then he studied under Shitahara YOSHIHIDE 下原吉英 started at 18 years old. Initial smith name was IEHIDE 宅秀 later changed to HIDEKUNI 英国. He had become a sword maker for the vassals of the Yamagata domain in Anei 3 (1774) to change his smith name to Kawabe Gihachirou MASAHIDE 川部儀八郎正秀 and called himself as SUISHINSHI 水心子. He later became an exclusive maker for the vassals of the Tatebayashi domain while he lived in Hamamachi town in Bushu Edo (now in Nihonbashi Hama-machi, Chuō ward, Tokyo) to instruct many pupils such as famed smiths Taikei Naotane 大慶直胤 or Hosokawa Masayoshi細川正義. 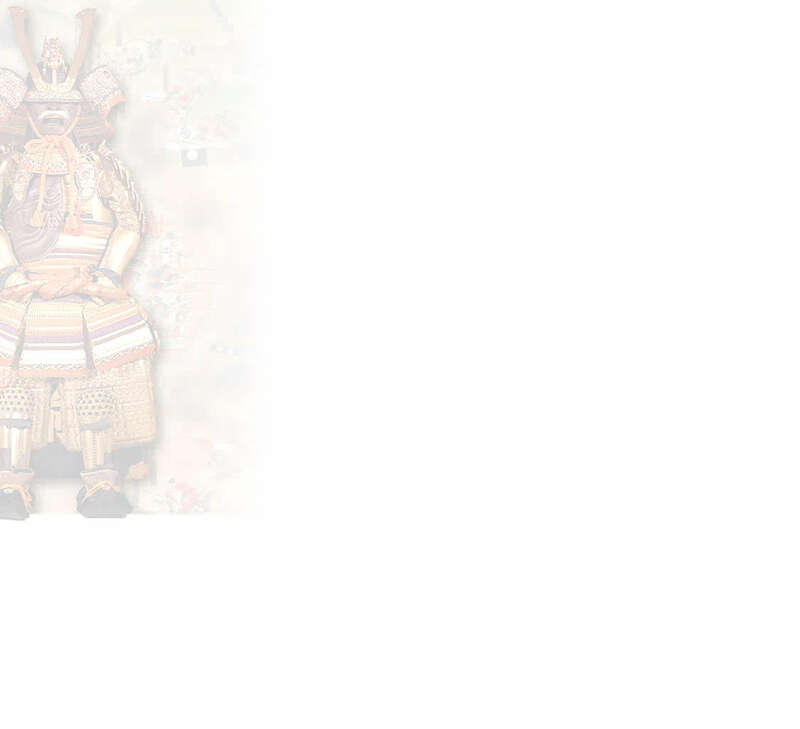 He officially retired in the Bunsei 1 (1818), at 69 years old to give the name to his son SADAHIDE 貞秀. However he still made the swords in the name of AMAHIDE 天秀 under the collaboration work with his son "2nd gen. Suishinshi MASAHIDE 二代水心子正秀". He passed away in the 27th day, 9th month, Bunsei 8 (1825) at 76 years old. In view of his 50 years work of arts, the early stage, 1774-1789 shows Soushu-den arts of work while he was strongly influence by the ancient works by Masamune 正宗　or Shizu 志津, then middle stage he mostly worked for the re-production of the Douran-midare Big-wave temper works by Tsuda Echizen-no-kami SUKEHIRO 津田越前守助広 or sometimes the works of wide wavy temper which shows close resembles to one of Inoue SHINKAI 井上真改 then the last stage in his later years, he mostly proposed the priority of Bizen-den arts of work. 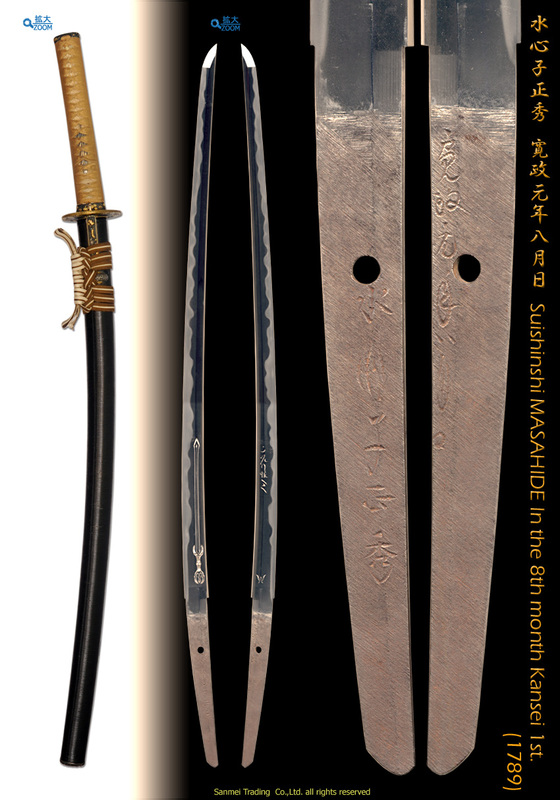 This katana dated Kansei 1, (1789) at 40 years old while he had mostly made Osaka-shinto style splendid works. Simple carvings on both sides are supposed as his own work, while elaborate dragon carvings were mostly made with his pupil Honjo YOSHITANE 本荘義胤. In view of Doran-midare temper, in compare with ones of SUHEHIRO, starting temper YAKIDASHI is longer so called Kyo-style, Indication of two Gunomes group together and repeats regularly, uneven in size and height nor Nie glitter doesn't attach uniformly. White Rayskin gold-brown cord lozenge wrap hilt. Menuki : Gohei design, shakudo Yobori, Gold inlaid Iroe. Fuchi/ Kashira : Autumn flowers design, shakudo Takabori Gold inlaid Iroe. Tsuba : Autumn flowers and Crickets design, shakudo ground, Round-shape, Gold inlaid Iroe. 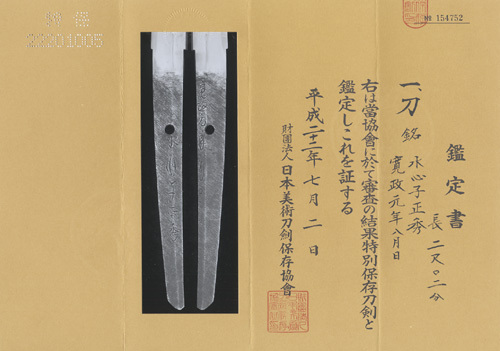 Original gold foiled copper habaki, preserved in a shira-saya (Sato Kanzan Sayagaki) plain wood mounting.